Regional flight over boulders and the Bode Gorge Reservoir and back to Weningerode. Scenic flight Green Route 15 min. / Blue Route 20 min. / Red Route 30 min. There are the local attractions served according to the weather and desires of the passengers. The route depends on the weather and of course flight safety, otherwise the pilot trying to fulfill your wishes in compliance with the flight time. 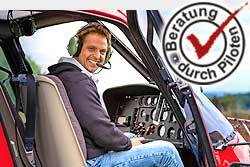 When you post the entire helicopter (exclusive flight) can be discussed on the spot with the pilot the route.